We are engaged in manufacturing, exporting and supplying excellent quality Hand made Vintage Bagpacks to our valuable clients.HAG Art and Craft is a sole proprietorship organization, incorporated in the year 2008 as a manufacturer, supplier and exporter of a comprehensive range of Handicraft Bag, Vintage and Tribal Textiles. We provide our best service to our customer not only to make them satisfy with deals but also to make us feel that we are a great service provider. We have a dedicated customer care team to assist our customer in the most convenient ways from the day we receive the inquiry till the day customer gets satisfied after receiving their product. Our customer care keeps an account of all the inquiries and also welcomes the requests of buyers for any custom made and specific kind of products. 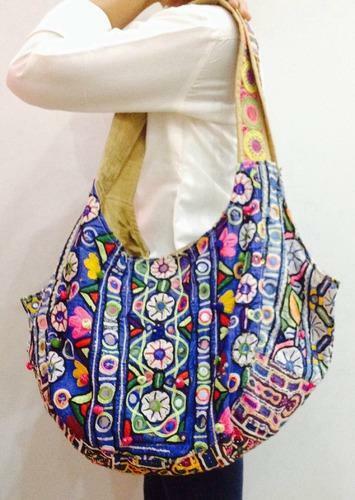 This Banjara Boho bag is made up of Vintage Banjara cloth with Hand embroidery and mirror work on it with cotton pompoms. Fine cotton lining inside with a zip and a patch pocket inside. Closer by hidden magnet button. Delivery Time Within 7-10 days after confirmation. Production Capacity 1000 pieces per month. Packaging Details Customise Wrap Packing. We "HAG Art & Craft" were established as a Sole Proprietorship firm, in 2015. We are leading organization actively engrossed in manufacturing and supplying of Handmade Clutch, Ladies Mojari And Slipper, Handmade Bag, Ladies Handmade Necklace, etc. Designed with perfection, our provided handmade products are the foremost choice of our clients owing to their attractive design, perfect finish, beautiful colors, etc. We have adopted ultra-modern technology in all our business process which drives us to become the first preference of our esteemed clients. These handmade products are strictly checked by our quality experts on various parameters of quality in order to ensure a better quality product range for our valuable clients.